Boxing history is chock full of great rivalries, though now we can only pine for the days when pugilists thought nothing of squaring off against an adversary several times in a single year. As it is, the trilogy, playing as it does on the importance of the number three in so many cultures, is the series of choice, the most famous being the Muhammad Ali vs Joe Frazier triumvirate for the ages. And yet, that series, as momentous as it was, is dwarfed by the sequence of battles from long ago between Ted “Kid” Lewis and Jack Britton. Their first tilt was followed by no fewer than 19(!) sequels, of which seven, by my count, were title bouts. With all 20 matches happening between 1915 and 1921, it remains boxing’s most prolific, if not best-known, rivalry. One half of it, Ted “Kid” Lewis, was born Gershon Mendeloff in London’s East End on October 24, 1894, right around the time Britain’s favourite son, “Ruby” Robert Fitzsimmons, plied his trade against the best of his day. 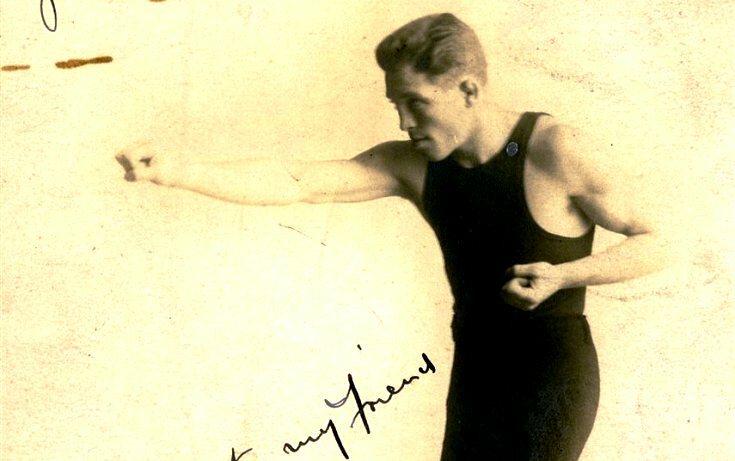 In time, Lewis would become as renowned as “The Freckled Wonder” and one of England’s most cherished fighters, not to mention, by many accounts, the greatest pound-for-pound pugilist to ever emerge from the United Kingdom. Starting his professional career at the tender age of 14 in an East End theatre, Lewis boxed for meagre pay but was immediately successful. Although his most famous bouts would take place in the welterweight class, his nascent career saw him compete as a bantamweight. His first taste of championship success occurred just a few weeks shy of his nineteenth birthday when on October 6, 1913, Lewis TKO’d Alec Lambert after 17 rounds for the vacant British and European featherweight titles. The following year saw Lewis make a brief sojourn to Australia, winning four out of five, before heeding the call of America where fame and fortune awaited and where he would live and fight for the next several years. During this time Lewis maintained an extremely hectic schedule; in 1915 alone he fought at least 21 times. And it was during this period that Lewis changed his ring form. He had started out as a shifty boxer with a long left lead, but while in America he modified his style, eventually becoming a swarming boxer-puncher with an ability to throw deadly, rapid-fire combinations. Needless to say, this change pleased the public which came to love the brave Brit’s all-action style and willingness to take on fighters bigger and heavier. 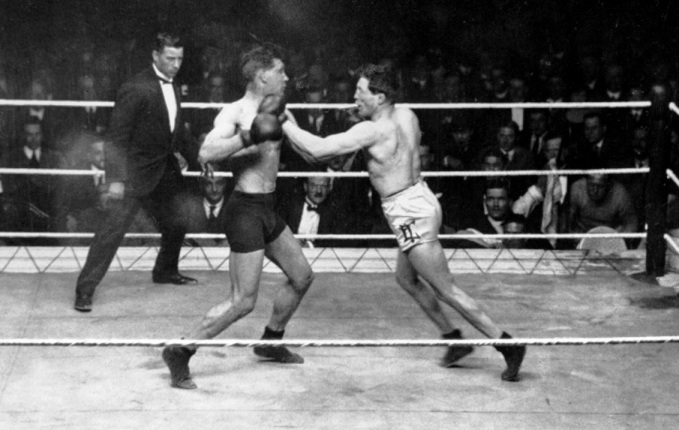 Lewis (right) attacking Tom Gummer, Feb. 16, 1922. Lewis won by first round KO. His first match with Britton took place on March 26, 1915 in New York and the newspaper decision went to Lewis’ rival. Adding some spice to their struggle for welterweight supremacy was the fact both Lewis and Britton held a genuine loathing for the other, refusing to speak and usually forgoing the customary handshake before each of their contests. It is hard to know precisely why Lewis disliked Britton, but Britton’s rancour was plain as day: a proud Hibernian, he held a grudge against the English Jew. 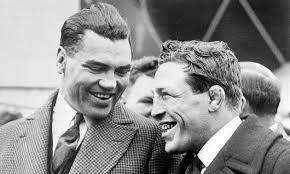 A pair of greats: Jack Dempsey and Ted Lewis. Lewis stayed and campaigned in America for the next four years, during which time the welterweight title changed hands almost exclusively between he and Britton. Their feud included three battles in the span of a single month in June of 1916 as well as a very satisfying triumph for Britton and Morgan on St. Patrick’s Day, 1919. Morgan was so pleased after that particular win, he sent a telegram directly to Buckingham Palace to boast of an Irishman’s victory over an English champion. 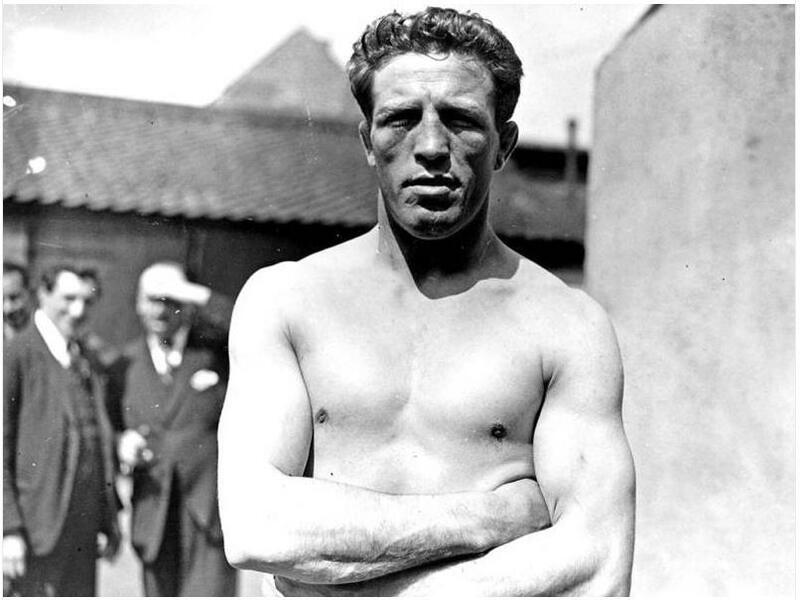 In December of 1919 Lewis finally returned to England to continue his career and campaign as a welterweight. And a middleweight. And a light heavyweight. What’s more, he was an immediate success. Johnny Basham fell to his two-fisted onslaught in nine rounds on June 9th, 1920, and Lewis claimed the European welterweight title. Other notable wins were a rousing 20 round victory over Jack Bloomberg, a middleweight, and Lewis staking his claim to the British middleweight and light-heavyweight championships, as well as the European middleweight title. Lewis was even knocking out heavyweights, such was his confidence. 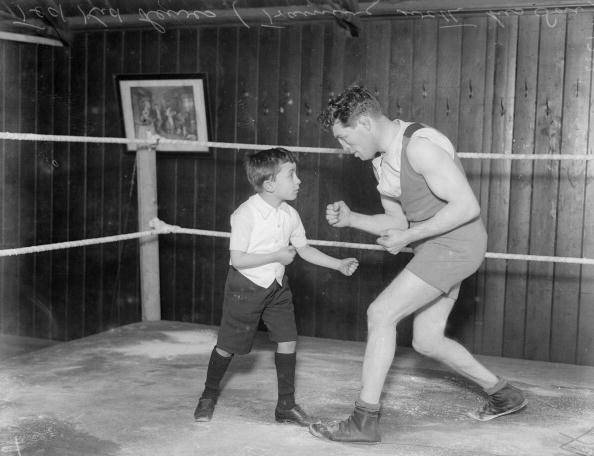 In this 1923 photo Lewis playfully squares off with his young son. This same confidence spurred Lewis on to challenge “The Orchid Man,” France’s Georges Carpentier, for the world light-heavyweight title in London on May 11, 1922. For many patriotic Englishmen, the task at hand was attainable for the champion who had brought them such glory in years past. But the fight ended in the first round from a clean punch and a momentary lapse in judgement. 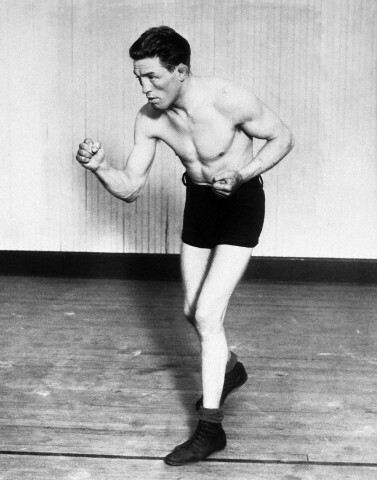 Lewis had been mauling the larger Carpentier with his trademark “smashing, bashing” style, throwing a bevy of ripping uppercuts to the body with both hands and exploiting his knack for punching effectively while being clinched, when he turned to the referee who was warning him about holding. This break in concentration cost Lewis everything: Carpentier instantly struck with a vicious right hand at this most propitious of moments and ended the fight.